I wanted to create a Funky Abstract Style, writhing and wriggling with bold colours, bright shapes and intricate designs! The shape was created spontenouly.I then painted in various shapes, one color at a time. For instance, first I painted in all the yellow shapes. Then all the orange shapes, then dark pink, light pink, etc. I strive to create a balanced variety of shapes and colors. 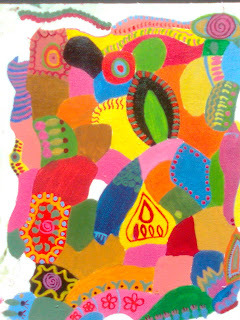 The idea is that the different shapes and placement of colors will cause the viewer's eyes to bounce around the canvas. In this way I seek to create a sense of movement and energy in these funky artworks. So I continue painting in these shapes until the white canvas is entirely covered. The repetitive designs start to form funky, sometimes intricate patterns. Creating a pattern is one element you can use to make an abstract work of art. There are many different shapes and colors, but there is an overall feeling of balance and harmony.